DAIMONOLOGIA: Beware of Demonic Biblical Exegesis! Beware of Demonic Biblical Exegesis! "At the beginning of the monastic life some of the unclean demons instruct us in the interpretation of the Divine Scriptures. And they are particularly fond of behaving in this way in the case of vainglorious people and of those who have been educated in secular studies, so that by gradually deceiving them they may lead them into heresy and blasphemy. We can recognize this diabolical theology, or rather, theomachy, by the disturbances and the confused and unholy joy which are felt in the soul during the instruction." 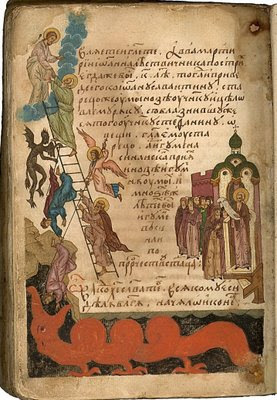 Illustration: a Slavonic-language manuscript of The Ladder of Divine Ascent, Russia, 1560. Can Demons Suffer Physical Harm?